Around midnight last night Mr. Idiot was pounding away trying to free a lock on his bicycle which was chained up to a post. Noise carries loud and afar at that hour of the night so it's disturbing the entire neighborhood. However, Mr. Idiot keeps playing his tune entertaining the neighbors without missing a beat. 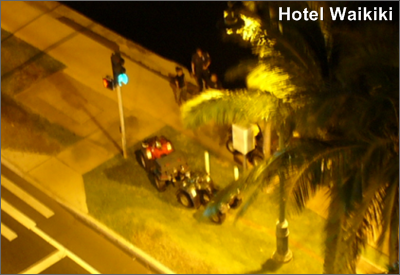 Next thing you know it the cops arrive and also some cops on four wheeler atv's who must have have been patrolling the Ala Wai canal stopped to check the situation out. Two of the Mr. Idiot's friends get handcuffed and whisked away in patrol cars I'm guessing due to outstanding warrants. What about Mr. Idiot whose bike in most likelihood was stolen property? I know him from around the neighborhood. He returns an hour later and resumes pounding away at the same lock for what musta been another two hours. I was gonna say that you are one determined paparazzi by hanging in there with the stealth shots, but then with all that noise, how could anyone possibly sleep? I guess McGarret and Danno were too busy doing something else to save the day...errr..night. Rowena- they couldn't see me up high and from the dark lanai. The pics are cropped, so things appear closer than they actually are. I just been make sure the flash was off. My neighbor was shaving the paint off his car late at night for several nights. I was going to call the cops, cause you are not supposed to make noise after 7 pm and there he was around midnight. Instead, I simply walked to his garage and asked him to stop making noise. And, guess what, he complied!!! That is a seriously brain handicapped person. I wonder why the police didn't come back and just book him? 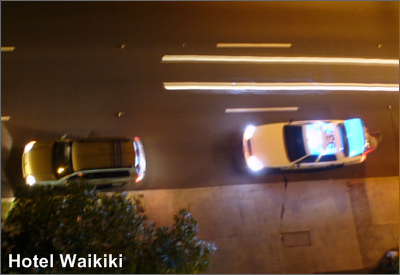 don't share the bad stuff about Waikiki! gigi- perhaps, you scared him. That wasn't nice of you. Wink. Kay- "....wonder why the police didn't come back and just book him?" nobody called 911. That's how the neighborhood is getting to be. Everybody waits for the next person to call. Some nights, it's a game. Cloudia- truth be told, much more from where that came from. Stay tuned.